I do not like holiday that cause I always forget send my family and friends some holiday card. I also do not like send e-card, some website just grab your email address and sell it to other partners, you will get a lot spam late. But Flower2mail seems a little bit different. 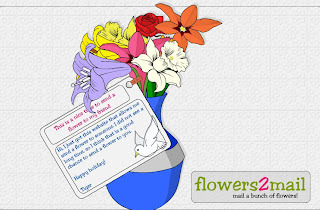 Flower2mail is a fun mail service that allows you send flower card to your friends anytime, if you like you make a sending schedule. 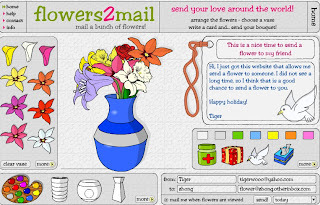 It is really simple, just pick something you liked flower, vase, fill you message and email address, click send button, that is all you need to do. It based on flash player, so you need have flash player you can play it. After your friend got email he can click a link, it takes to its site to view. Everything is basic but a little bit fun.